Extraction is the section of the Bitumen Production facility where bitumen is separated from the sand using water-based gravity separation. Although plant configurations vary across the operators, the Primary Extraction Cell or Vessel is the heart of the circuit. The heart of any Extraction plant is the main gravity separation vessel, where up to 90% of the bitumen is recovered. Depending on the operator, these vessels are termed the Primary Separation Cell (PSC), Primary Separation Vessel (PSV) or simply the SepCell. Although the names might be different, the shape, design and operation of these vessels are all very similar. Oil sands slurry from the Slurry Separation Plant (SPP) normally has a density of 1.50 to 1.58 t/m³. The slurry is pumped to Extraction through the Hydrotransport line, which terminates at the inlet of the gravity separation vessel. Expanded pipe diameter: The diameter of the inlet piping is typically expanded to reduce the velocity of the slurry before it enters the feedwell. The normal velocity of Hydrotransport slurry is 3 to 4 meters per second, which is far too fast and too turbulent to be fed into the vessel. Expanding the inlet piping diameter slows the velocity of the slurry, reduces turbulence and lowers impact forces on the feedwell. Pipe slope: Inlet piping is also sloped towards the feedwell to ensure no accumulation of sand occurs at the inlet of the vessel. A slope of 3º is generally sufficient to prevent build-up of coarse material. Proper feedwell design is crucial for good separation in the vessel. Feedwells can have either a radial or downcomer design. In a radial feedwell, the slurry flows tangentially in a swirling action. Downcomer feedwells are simpler in design, with the slurry taking an abrupt 90º turn and flowing straight down. The bottom (or outlet) of the feedwell has a cone-shaped deflector plate, which distributes the slurry in a radial pattern. to evenly distribute the slurry radially within the gravity separation vessel, which is particularly important for the coarse material. Slowing down the velocity of the slurry is crucial to good separation in the vessel. All gravity separation units rely on a quiescent environment. Any amount of turbulence disrupts separation and prevents settling of the finer particles. A well designed feedwell absorbs the energy of the oil sands slurry, ensuring it enters the vessel at a relatively slow speed. Another key feature of the feedwell is even distribution of the oil sands feed. Oil sands slurry contains bitumen, water, fine solids, coarse sand and the occasional rock or oversized debris. Heavier objects will take different trajectories than the finer solids. If the coarse sand and rocks are not evenly distributed, they will strike the wall of the vessel at exactly the same location, eventually wearing a hole in the cone section. Even feed distribution is therefore critical to preventing premature failure of the gravity separation unit. During normal operation, the gravity separation vessel will build up a bitumen froth layer from 1 to 2 meters deep. The aerated froth overflows into a radial launder, which spans the entire perimeter of the vessel. Froth launders have a very generous slope as they wrap around the vessel. The outlet piping is obviously located at the low point of the launder. The bitumen froth then gravity flows to a deaeration column where air is removed from the froth to facilitate pumping to downstream equipment. Froth launders are typically insulated to prevent heat loss. Bitumen froth will quickly turn to a molasses-like fluid if cooled below 30ºC. It is therefore critically important to make sure bitumen froth never be allowed to cool down. Once cooled, the froth becomes almost impossible to pump by conventional methods. Note that this particular gravity separation vessel is equipped with grizzly screens which cover the top of the launder. These screens capture oversized material or debris to avoid plugging of downstream equipment. Also visible is the underwash piping ring header. Downcomers extend deep into the froth layer and spray hot water underneath the bitumen froth, providing additional cleaning and heating. Most gravity separation vessels are equipped with froth underwash systems. Underwash refers to the spraying of hot water below the bitumen froth layer. Underwash pipes are typically vertical downcomers which connect from a header installed on the top of the froth layer, either inside or outside the vessel. The downcomers extend below the froth layer and into the top of the middlings zone, typically 1.5 to 2 meters below the froth launder lip. Underwash water forms a layer of hot water below the bitumen froth. This hot water acts to "clean" the bitumen droplets as they rise to the top of the vessel and encourages the release of any trapped fines. Underwash water is normally very hot, typically 80 to 95ºC. This helps reduce the viscosity and surface tension of the bitumen, which should translate to better air attachment and less fines contamination. 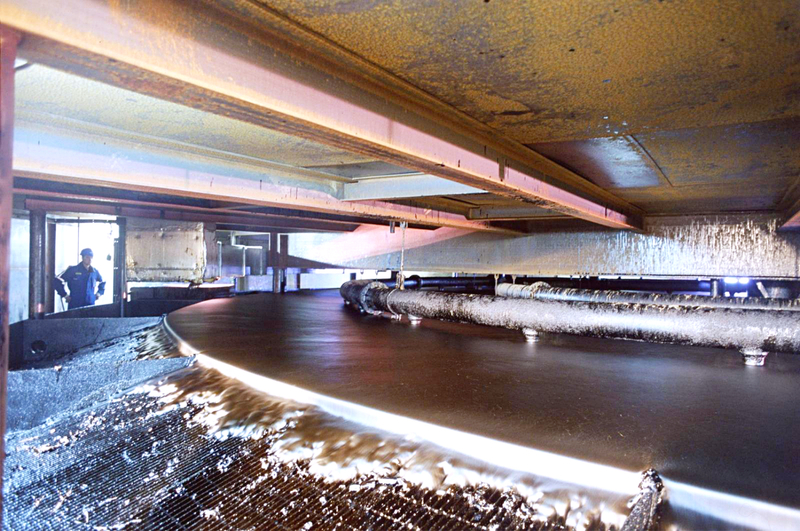 Hot underwash water also helps heat and deaerate the bitumen, reducing the steam load in the downstream froth heating or deaeration units. Note that when underwash piping is installed outside the vessel (and exposed to the elements), it should be properly insulated to prevent freezing during winter operation. It is also important that water always be flowing through underwash piping to prevent the bitumen from plugging the downcomers. The underwash piping header is visible on the roof of each vessel. Downcomers drop vertically through the roof and spray hot water underneath the bitumen froth layer, providing a small amount of cleaning and heating. Sight glasses are installed on the side of the vessel within the froth/middlings zone, typically spanning a length of 2 meters below the top of the froth launder. A camera transmits the image back to the Extraction Plant control-room operator. Digital imaging software is sometimes used to convert the visual image to data values that can be used as control variables. the clarity of the froth/middlings interface. Clarity of the interface is by far the most important indicator of the "health" of the gravity separation vessel. A well performing vessel has a crisp, clean interface, showing a sharp division between the froth and the middlings. This indicates very good bitumen recovery and typically occurs when processing oil sands with very little clay or fines. Conversely, a fuzzy interface indicates poor separation efficiency and warns of low bitumen recovery. The colour of the froth layer is also a very important indicator of bitumen grade. High grade froth tends to be a rich, almost black colour. Low quality froth tends to be more brown, indicating a high clay content. The exact location of the froth/middlings interface is a very important control parameter. If the interface is too high, middlings will get pulled into the overflow launder and contaminate the bitumen froth with solids and water. If the interface is too low, bitumen will get pulled into the middlings zone which can compromise bitumen recovery. The middlings zone sits underneath the bitumen froth layer and consists mainly of fine solids, clays and unaerated bitumen. Middlings tend to linger in the centre of the vessel and can build-up over time. 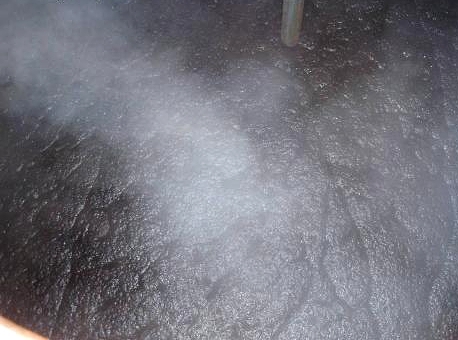 This can lead to poor bitumen recovery and deteriorate the quality of the bitumen froth product. In order to avoid accumulation of these middlings, this fine slurry is removed from the main gravity separation vessel and reprocessed in a separate bitumen recovery circuit, typically consisting of conventional flotation cells. Withdrawal piping extends into the middlings section of the gravity separation vessel. These middlings then gravity flow to a secondary recovery circuit. The design of middlings withdrawal piping varies across the operators. Some facilities have a very simple open-ended pipe extending into the wall of the gravity separation vessel. Other operators have more elaborate withdrawal piping, with several headers extending radially around the inside perimeter of the vessel. Some withdrawal piping is perforated (with relatively large holes) to ensure middlings is evenly removed around the perimeter of the vessel. However, the data would suggest the design of the piping is not that important, as long middlings is withdrawn from the outer edges of the vessel, and not from the centre (underneath the discharge of the feedwell). The most important design criteria for middlings withdrawal piping is the height at which the middlings is being withdrawn. If the withdrawal piping is too high, bitumen from the froth layer will get pulled into the secondary recovery circuit, which can compromise bitumen recovery. If the middlings piping is installed too low, coarse tailings will get drawn into the secondary recovery circuit, reducing the effectiveness of the entire secondary flotation circuit. Ideally, middlings withdrawal piping is installed below the froth zone, typically about 2 to 3 meters below the launder lip level (lower for mines with a higher grade of oil sands and higher for those processing lower quality ore). Middlings withdrawal heights can vary greatly among the operators and can sometimes be a trial and error ordeal. The volume of middlings withdrawn is controlled by a throttle valve (or control valve) installed outside the vessel on the main piping header. It is important to make sure the piping is large enough to accommodate the larger flows required when processing low-grade ore when the volume of middlings that needs to be removed is much greater. Note that when processing very good quality/high-grade oil sands, there may not be any need to withdraw middlings. In this case, the secondary recovery system can be shut down without compromising bitumen grade or recovery in Extraction. The shape of the cone section is critically important to any gravity separation unit. The angle must be steep enough to prevent sand accumulation on the side walls and ensure the coarse solids are always continuously flowing to the outlet. If the slope is too shallow, sand will build-up on the side walls, eventually sloughing to the centre which can lead to plugging of the cone section. Most vessels have a cone angle of 55º to 60º, with 60º being the ideal angle to guarantee uniform, continuous flow of the solids (sometimes referred to as mass flow). Some older installations use vessels with very shallow angles. These vessels are equipped with rakes which rotate around the vessel to slowly move the coarse solids to the centre (much like a tailings thickener or water clarifier). Shallow-angled vessels are cheaper to build but the rakes can be very high maintenance. These shallow-bottomed separation vessels have been virtually phased out in newer oil sands mining installations. 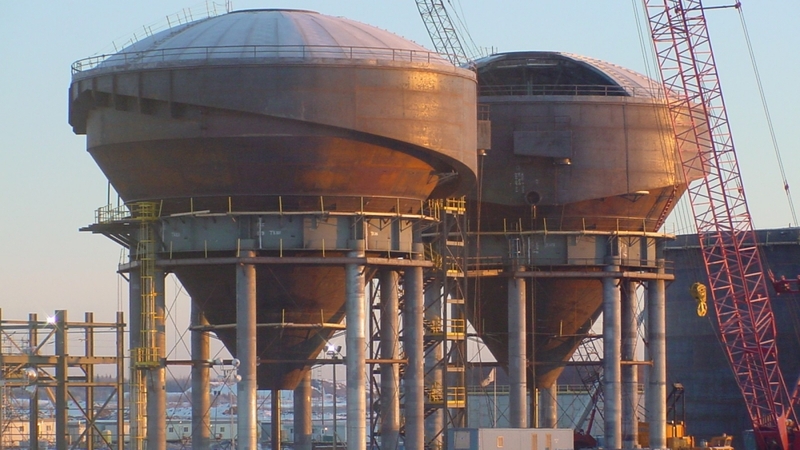 Regardless of the cone angle used, all gravity separation vessels are equipped with large flushing connections at the cone section of the vessel. These large flush lines are designed to provide copious amounts of water in the event the underflow or cone begins to show signs of plugging. Gravity separation vessels can either have a flat or domed roof. The shape of the roof does not affect the process but impacts the structural design of the vessel. A domed roof is aesthetically more pleasing, does not require internal support beams but is more expensive to build due to higher complexity of construction. A flat roof is simpler in design and cheaper to build. When designing a flat roof, special care must be taken to ensure the roof doesn't sag in the centre. This can lead to accumulation of water during rain events or snow melts. Middlings displacement describes the re-injection of fine tailings from the middlings flotation circuit back into the cone section of the gravity separation vessel. The theory behind middlings displacement is that injecting of these bitumen-free fine tailings into the cone reduces the downward flux of the slurry and prevents bitumen droplets contained in the middlings zone from being pulled into the underflow, subsequently being lost to tailings. However, evidence suggests that much of the middlings displacement stream simply gets short circuited out with the coarse tailings underflow, perhaps due to the fact the fine tailings are being injected too low. Another undesirable side-effect of middlings displacement is the increased circulating load and corresponding reduction in vessel residence time. Unfortunately, the jury is still out on whether middlings displacement is an effective method of reducing bitumen losses. The concept of middlings displacement was originally patented by Suncor in 1974. However, middlings displacement is more commonly found in facilities that have adopted the Syncrude Low Energy Extraction (LEE) process (such as Aurora, Muskeg River and the Kearl Oil Sands Mines). These gravity separation vessels have a shallower cone angle (typically 55º) and middlings re-injection helps to preventing sloughing in the shallow cone section. PSC, PSV OR SEPCELL - WHAT DOES IT ALL MEAN? 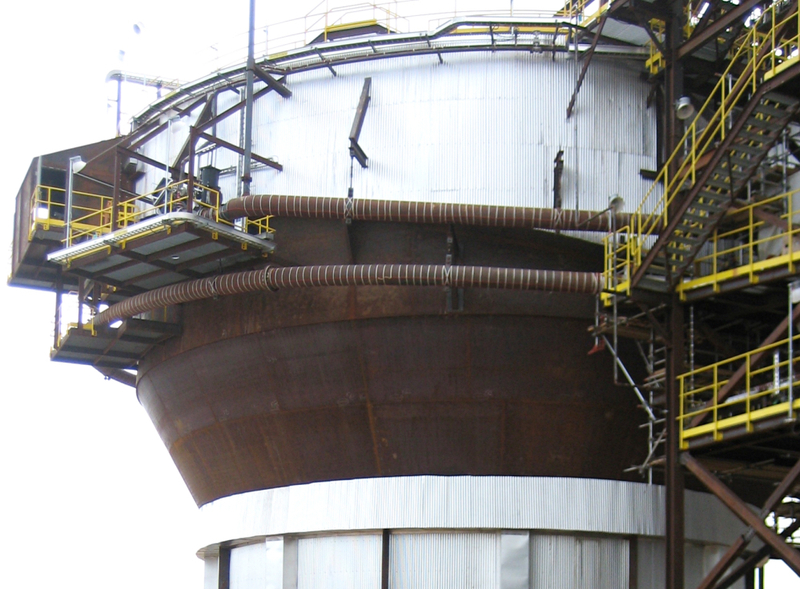 Different oil sands operators have different names to describe these large cone-bottomed gravity separation vessels located in the Primary Extraction Plant. 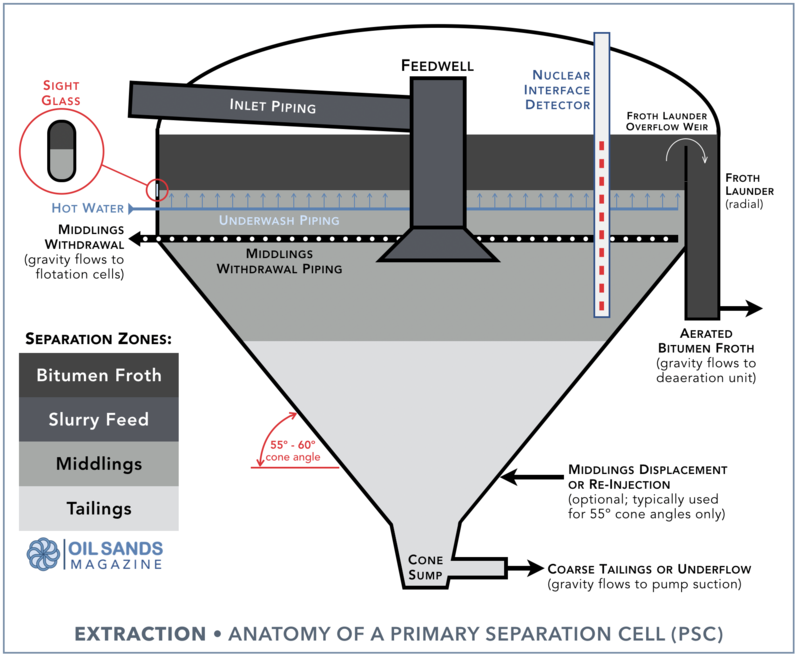 The terms PSC - Primary Separation Cell and PSV - Primary Separation Vessel are the most common, but some operators just use the term SepCell, short for Separation Cell. 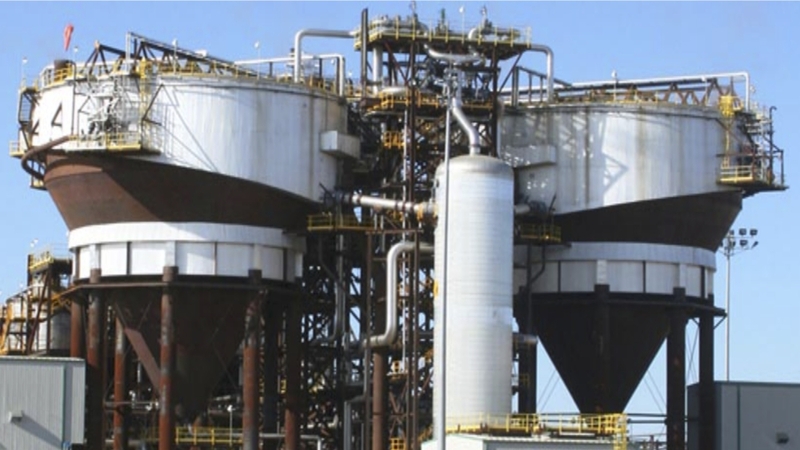 As with all slurry systems in the oil sands, Extraction equipment, including the gravity separation vessel, is subject to both corrosion and erosion. Material selection is a key design element in helping to extend the service life of the vessel and reduce maintenance costs. Since gravity separation vessels are normally not spared, an unplanned failure would result in a complete shutdown of the Extraction train. The slurry piping that feeds into the gravity separation vessel is subject to the same wear-and-tear as all other slurry piping. Since the inlet piping has a larger diameter than the rest of the Hydrotransport line, this section of pipe is far more prone to settling of the coarse solids. Since the pipe is sloped towards the feedwell, this prevents the line from sanding but unfortunately also causes the coarse sand to slide along the bottom of the pipe. This tends to wear the bottom part of the pipe much faster than normal. Many operators choose to overlay the entire inlet piping with chrome carbide, improving its wear-resistance. Like all other slurry piping, piping with localized wear can be rotated several times before needing to be replaced. Feedwells are subjected to both abrasion and impact. Feedwells are always lined with wear resistant material, typically chrome carbide wear plates although chrome white-iron castings have also been used with some success. Wear plates also cover the top of the distributor plate at the outlet of the feedwell, which is also a very high-wear location. One important consideration when designing Extraction plants is ease of accessibility for removal of the feedwell. Large capacity cranes with a long reach should be able to reach the top of the vessel (which can be over 30 meters tall) and pull the feedwell straight up vertically (note that the feedwell itself is typically several meters tall). The life span of a feedwell in a gravity separation vessel is approximately 2 years, but inspections are normally carried out on a yearly basis. The lower section of the gravity separation vessel is completely lined with wear plates, commonly made of chrome carbide. The lower half of the vessel is subject to corrosion-accelerated erosion from the fine and coarse slurry as well as the oxygenated process water. Duplex stainless steel plates made of Duracorr® therefore make an excellent choice for wear-plates since they are more corrosion-resistant than chrome carbide. Much like the feedwell, the internals of the vessel are typically inspected yearly, with re-lining normally required every 2 years. Another weak point in the vessel are the outlet nozzles, which experience localized wear from the rapid outflow of slurry. Nozzles are commonly overlaid with tungsten carbide to improve wear-resistance and should be inspected more frequently than the rest of the vessel. The internal plates are accessed from the bottom of the vessel by removing the cone sump and scaffolding up the inside of the vessel. Inspection of the internals is usually done coincidentally with the replacement of the feedwell. This requires a lengthly plant shutdown, normally in the order of several weeks. The froth launders are not high-wear points and are commonly just coated with epoxy to prevent corrosion. The inside of the roof is typically galvanized. Unlike pumped systems, middlings withdrawal piping are subjected to gravity flow past the flow control valve. This causes the fine solids to slide along the bottom of the pipe at a high velocity. Middlings withdrawal piping therefore experiences rapid localized wear at the bottom of the pipe. It is therefore common to overlay the entire span of middlings piping with chrome carbide. However, even lined piping has a relatively short life span and still needs to be replaced yearly. Another very high-wear component is the control valve which throttles the flow on the middling withdrawal line. Using a control valve to regulate flow on a slurry line is not an easy task. These valves see a very high pressure drop and are susceptible to premature failure due to abrasion from the fine-solids. Heavy duty knife-gates with chrome or tungsten-carbide overlay are generally used for this service. Wear-resistant ball valves and pinch valves have also been used with some success. It is not uncommon for these valves to only last a few months before needing to be replaced. The gravity separation cell is equipped with numerous instruments which gauge performance of the vessel and enable control of the operating parameters. Some key instrumentation features are listed below. Nuclear density profilers: Nuclear density profilers are arguably the Cadillac of all interface detectors. Nuclear sources and detectors are positioned along pipes installed vertically from the roof of the vessel. The nuclear sources/detectors are typically several inches apart along the pipe, providing a density reading at each level. Nuclear density profilers are the most expensive but most reliable form of interface level measurement. The cost of the profiler is mostly a function of the length of area scanned and the number of detectors installed. The closer the nuclear detectors, the more accurate the interface reading within that zone. One of the more popular suppliers of nuclear density profilers in the oil sands industry is Tracerco. Pressure gauges: Pressure measurement is a low-tech (and inexpensive) method of calculating slurry density and in turn estimating the interface level. Pressure instruments are installed along the wall of the gravity separation vessel, at various heights (typically within the froth/middlings zone, but can also be installed down into the cone section). Since the total head of the slurry system is fixed (i.e., the distance between the pressure instrument and the top of the launder lip), the average density of the slurry above the pressure instrument can be calculated from each pressure measurement. Once the density is known at each interval, an approximate location of the froth/middlings interface can be calculated. Pressure measurement is an inexpensive way to estimate densities and interface level, however reliability and accuracy is not the greatest. Pressure instruments are normally equipped with membranes to prevent slurry contamination. If relying solely on pressure for interface level measurement, it is highly recommended to install sufficient redundancy. Digital imaging software: A less common technique for measuring interface is the use of digital imaging software. Cameras installed on the sight glasses transmit an image which is converted to data is used to calculate the interface level. New software can actually provide an estimate of bitumen grade/recovery based on the colour of the froth layer or the clarity of the interface. Digital imaging software is becoming increasingly more popular in the oil sands. The cost of camera installation has dropped and the accuracy of digital imaging software has improved dramatically in the past few years. Middlings density is measured through densitometers installed on the middlings withdrawal lines. These lines also have flowmeters which measure outflow from the middlings zone and autosamplers which periodically take stream samples for bitumen mass balancing. The most important design consideration for installing instruments on the middlings withdrawal line is to ensure the instruments are installed upstream of the throttle valve, since this section of pipe is guaranteed to be full. Flow downstream of the throttle valve is open-channel gravity flow, so the slurry will tend to segregate (with solids falling to the bottom and bitumen typically skimming along the top). Installation of instruments on open-channel flow pipes is never recommended. The density of the coarse tailings underflow is measured though a densitometer installed on the underflow pipeline. Flowmeters and autosamplers are also found on underflow lines for measurement of vessel outflow and estimates of bitumen recovery rates. Since the underflow lines are full pipe and pumped systems, the slurry is very well mixed and these instruments can be installed anywhere on the line. The use of sonar flowmeters is becoming increasingly popular over Venturi-type or wedge flowmeters since sonar flowmeters are non-intrusive and do not contribute to localized wear. The density of the slurry feeding into the vessel is normally adjusted by adding water into the Hydrotransport slurry. During Hydrotransport, it is desirable to maximize the slurry density in order to improve ablation and liberation of the bitumen droplets. However, this density is too high for the gravity separation vessel. Water is therefore added into the very end of the Hydrotransport line, just before the slurry enters the feedwell. Since there is no densitometer at the end of the inlet piping, a calculation block estimates the amount of dilution water required (sometimes referred to as flood water) based on the density and flow readings from the Hydrotransport pipeline. Specific gravity of the oil sands slurry is typically reduced from 1.55 in the Hydrotransport line to about 1.40 t/m³ before entering the gravity separation vessel. Note that if froth is being recycled from the middlings flotation circuit, this flow needs to be taken into account in the density calculation, since the density of middlings flotation froth is just above 1 t/m³. The most important operating parameter for the gravity separation vessel is the level of the froth/middlings interface. If the level is too high, slurry will be pulled into the froth and deteriorate froth quality. If the level is too low, bitumen will get lost in the middlings zone and not be recovered to the overflow. The level of the interface level is adjusted by throttling the middlings flow control valve. As more middlings are removed from the vessel, the interface will get pulled lower. If the interface level suddenly surges (higher or lower), the underflow pump will normally override the control system and take over coarse control of the interface level. Once the interface goes back to normal, level control typically reverts back to the middlings flow control valve, which offers a finer control of interface. In a fully automated vessel, the underflow pump controls the underflow density (or the coarse tailings stream). Underflow density targets (or set-points) are normally quite high, in the range of 1.55 to 1.60 t/m³ (roughly 60-65% solids). This high density is important for good separation in the vessel and proper tailings deposition, which performs better at higher densities. However, this is typically the limit of the system's pumping capacity. If the density it too high (greater than 1.6 t/m³), the underflow is too dense to be pumped out by the centrifugal pump. In this case, the underflow pump would adjust the density lower by speeding up and drawing more water into the underflow, thereby lowering the underflow density. However, if the underflow pump slows down too much, the speed may drop below critical deposition velocity and coarse solids may begin to settle out. These solids can accumulate and eventually block the underflow line, which would shutdown the entire Extraction Plant and all upstream facilities. Underflow pumps are commonly equipped with minimum flow overrides that prevent the pump from slowing down too much, regardless of the density set-point or level of the interface. Also note, if the underflow slows down too much, middlings slurry may overflow into the froth launder which will deteriorate froth quality. Although most gravity separation vessels are normally designed with elaborate control schemes and overrides, it is not uncommon for these systems to be operated semi-manually by the control-room operator. These large vessels have a very long residence time and do not require constant adjustment of operating conditions. Operators will typically set the desired flow of dilution water, underflow and middlings withdrawal, then manually adjust as required. Good performance of any gravity separation vessel requires a very steady operation and very slow changes. If the vessel is being controlled by an automation system, extra care must be taken to make sure all process changes occur very gradually and the vessel is given enough time to respond before making another process change. Whenever the process takes a turn for the worse, the best course of action is to slow down and reduce throughput. Reducing oil sands feed lowers the solids loading and density in the gravity separation vessel, therefore increasing residence time. This allows the bitumen more time to attach to air bubbles and be recovered to the surface. Dilution also helps disperse the fines in the middlings zone and prevents gelling. However, adding more water is not equivalent to reducing throughput (even though the effect on density is the same). Adding more water without cutting back on feed actually lowers the residence time in the vessel, which is counter-production and does not help improve recovery. Admittedly, reducing throughput is an unpopular move (less throughput = less bitumen produced). However, this is often the quickest way to regain control of a poorly performing circuit. Oil sands feed with a high fines content needs more dilution and more residence time than a good quality ore. It is therefore normal to expect reduced production when processing a lower quality (or low grade) oil sands deposit. Low quality feeds are by far more sensitive to process temperature and can perform very poorly below 40ºC. At higher temperatures, the viscosity of bitumen is greatly reduced, lowering the surface tension of the bitumen. This increases the strength of the bitumen/air attachment and encourages liberation of the solids. A poorly performing vessel operating at 35ºC will greatly benefit from increasing the process temperature to 45ºC. However, a poorly performing vessel operating at 50ºC will likely not improve much by increasing the temperature any further. This is due to the fact that the viscosity of bitumen approaches that of water at 50ºC, then begins to level out. The process therefore does not benefit from operating beyond 50ºC. Process temperature is adjusted by controlling the temperature of the slurry water added in the SPP. Adding heat to the front end of the plant is very important since most of the bitumen/air attachment occurs in the Hydrotransport line. Increasing the temperature of the flood water at the inlet of the gravity separation vessel offers little process benefit. Low grade ores typically have a high clay content. Clays are ultra fine particles attach to the bitumen and prevent attachment to air. Although dilution can be helpful, addition of caustic soda (NaOH) to the oil sands slurry water in the SPP is far more effective when dealing with high-clay ores. The OH‾ ions from the caustic soda attaches to the edges of the positively charged clays and prevents attachment to the bitumen droplets. This leaves the hydrophobic bitumen free to attach to air bubbles, thereby improving bitumen recovery. Oil sands slurry normally has a pH of 8 to 8.5. When processing an ore with a high clay content, the pH can sometimes drop below 8, which is very detrimental to the bitumen recovery process. Enough caustic soda should be added in the SPP to bring the pH closer to 9 or 9.5, which is the ideal pH for Extraction. CAUSTIC ADDITION - WHY LESS IS MORE: A little caustic can be a very effective process aid, increasing repulsion of the clays and improving dispersion in the gravity separation vessel. In theory, more caustic would lead to more repulsion, which should directionally improve bitumen recovery. In reality, oil sands slurries can have a high concentration of salt (positively charged ions, or cations) such as Na and Mg. Due to the presence of these cations, too much caustic can actually cause gelling of the fines and clays, which is really bad. In fact, the ideal pH is 8.5 for normal ores to as much as 9.5 for deposits with a high clay content. Overdosing does not benefit the process and actually hinders settling in the tailings pond. So less is more when it comes to caustic addition.